An extremely well-constructed guitar from a custom shop that's deserving of serious recognition, especially at this price point. A properly unique - but nonetheless entirely versatile - signature model. Excellent build. USA Gibson pickups. Excellent array of tones. The latest addition to Epiphone's growing list of signature models is a Les Paul created for Lee Malia, guitarist with metalcore heavyweights Bring Me The Horizon. You'd be forgiven for expecting a high-octane blacked-out metal machine loaded with active pickups; instead, Lee has opted to base his signature on the Les Paul Artisan, an ornate LP produced by Gibson for a short period of time in the late 70s and known best for its banjo-style fretboard inlays, affectionately referred to as 'hearts and flowers'. What's such a pretty guitar doing in the hands of a metal guitarist, then? Well, Malia says he wanted to create a guitar that "appeals to anyone who plays any genre of music". With its vintage-style Walnut finish and bling-tastic gold hardware and pickups, he's certainly achieved that - this is one of the last guitars you'd expect to find in a metal player's hands! This Epiphone has been crafted in the company's Indonesian custom shop. Some may scoff that this branch of Epiphone couldn't possibly warrant the same level of respect as its American HQ, but all but the most pernickety of guitarists will be impressed when appraising the build quality, since - aside from the dodgily aligned rhythm/lead switch label - its construction is almost flawless. Strapped on, the weight is perfectly proportioned, and the neck's '1959' carve feels familiar and playable, with the 305mm (12-inch) radius and flat frets facilitating a pretty low action, allowing your fingers to flow up and down the neck with graceful ease. Those over-the-top fretboard inlays also serve as an accurate GPS for your fingers. 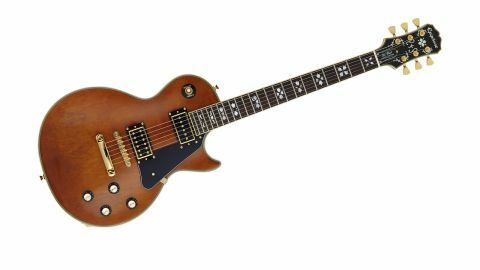 Unusually for an Epiphone, this model features USA Gibson pickups, and even more unusually, a single coil in the neck position. Tinkering with age-old designs is usually risky business, but the sound benefits from such a quirky appointment. The neck pickup doesn't lose much of the power and creamy tone you'd normally associate with a Les Paul's neck position, but in addition we now have a punchy, snappy characteristic at play, which works brilliantly for percussive rhythm playing and funky solos. As you would expect from a metal player's signature model, the bridge humbucker has been voiced for higher-gain styles, but it feels equally at home delivering hard-rock tones or metal brutality. As signature models go, Lee Malia's Les Paul stands out from the metal crowd with ostentatious fretboard inlays and gleaming gold hardware. However, plug in and any aesthetic preconceptions are negated by the more-than-capable rock and metal sounds produced by an extremely well-constructed guitar from a custom shop that's deserving of serious recognition, especially at this price point.